In Italy (and not only!) usually fish is cooked with white wine. It is always true? Not really! In many Italian regions such as Tuscany and Campania, octopus is braised in red wine. We call it “drunk” octopus. The result is a tasty main dish with a sauce to be enjoyed with a slice of toasted bread. Today we will prepare it in a particular version, with Concord grapes and potatoes, a new way to enjoy a very old recipe. Wash and clean the octopus eliminating the beak, eyes and entrails, then beat it with a meat tenderizer, breaking the internal fibers that would make it hard when cooked. Now, in a deep saucepan, saute the shallot roughly chopped and 1 garlic clove, crushed in 2 tablespoon of olive oil, along with hot paprika . When the sauteed is soft and translucent, add the warm pinot noir and a bay leaf. Once the wine has begun to simmer, plunge the octopus three times in the liquid, holding it by the head, until the tentacles are curled. Submerge it then completely, cover and cook it for 10 minutes, checking that the liquid continues to simmer. After this time, drain the octopus with a verdigris, retaining the cooking liquids. Cut the head into rings, separate the tentacles and reduce the rest to pieces as big as a walnut. Now, submerge it all again in the cooking liquids, and continue to cook for another 30 minutes until the octopus is soft. While the octopus is sauteed, peel the potatoes and reduce them into disks 1/4 inch thick. In a pan, saute 1 garlic clove crushed in 3 tablespoon of olive oil. When the garlic is golden, add the potatoes and 1 bay leaf.Continue cooking over medium heat for 5 minutes, turning the potatoes with a wooden spatula. At this point, add the fish stock little by little, keeping the pan covered until the stock is absorbed and will have formed a thick cream with the potato starch. A few minutes before the end of the cooking, add salt and add 5 pink peppercorns crushed with a knife. When the octopus is cooked, drain it, retaining the cooking liquids, Separate it from the garlic and the shallots, which we will keep, and maintain it warm. Put the recovered garlic and shallots in a new saucepan, along with 2 teaspoon of olive oil. When the oil is hot, add the strawberry grapes and switch to high heat for 5 minutes; then pour the cooking liquid of the octopus and reduce the sauce for another 10 minutes. Now we put it all in a vegetable mill retaining some grapes to finish the dishes and filter it with a perforated strainer. Put the sauce on the stove and let it cook another 5 minutes; Finally, add 5 pink peppercorns crushed with a knife. We place a ladle of strawberry grape sauce on the bottom of each dish and decorate with a few drops of olive oil, the remaining whole pink peppercorns and the grapes that we preserved. Then display the potatoes in the shape of a rose and lay some octopus on top. Dress it all with the more sauce and serve immediately. In Italy (and not only!) usually fish is cooked with white wine. It is always true? Not really! 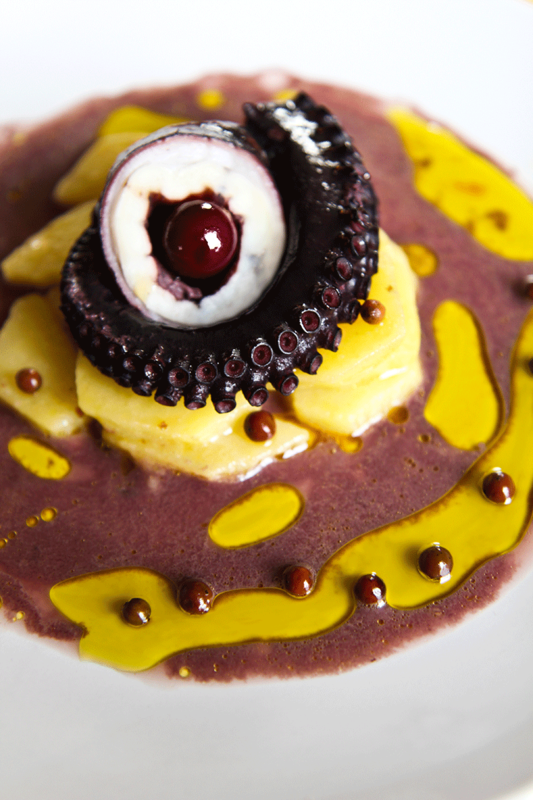 In many Italian regions such as Tuscany and Campania, octopus is braised in red wine. We call it drunk octopus. 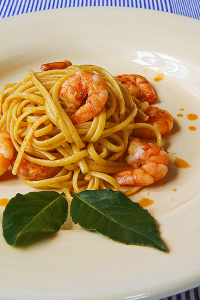 The result is a tasty main dish with a sauce to be enjoyed with a slice of toasted bread. Today we will prepare it in a particular version, with Concord grapes and potatoes, a new way to enjoy a very old recipe. BRAISE THE OCTOPUS - Wash and clean the octopus eliminating the beak, eyes and entrails, then beat it with a meat tenderizer, breaking the internal fibers that would make it hard when cooked. Now, in a deep saucepan, saute the shallot roughly chopped and 1 garlic clove, crushed in 2 tablespoon of olive oil, along with hot paprika. When the sauteed is soft and translucent, add the warm pinot noir and a bay leaf. Once the wine has begun to simmer, plunge the octopus three times in the liquid, holding it by the head, until the tentacles are curled. Submerge it then completely, cover and cook it for 10 minutes, checking that the liquid continues to simmer. After this time, drain the octopus with a verdigris, retaining the cooking liquids. Cut the head into rings, separate the tentacles and reduce the rest to pieces as big as a walnut. Now, submerge it all again in the cooking liquids, and continue to cook for another 30 minutes until the octopus is soft. POTATOES IN THE PAN - While the octopus is sauteed, peel the potatoes and reduce them into disks ¼ inch thick. In a pan, saute 1 garlic clove crushed in 3 tablespoon of olive oil. When the garlic is golden, add the potatoes and 1 bay leaf.Continue cooking over medium heat for 5 minutes, turning the potatoes with a wooden spatula. At this point, add the fish stock little by little, keeping the pan covered until the stock is absorbed and will have formed a thick cream with the potato starch. A few minutes before the end of the cooking, add salt and add 5 pink peppercorns crushed with a knife. CONCORD GRAPE SAUCE - When the octopus is cooked, drain it, retaining the cooking liquids, Separate it from the garlic and the shallots, which we will keep, and maintain it warm. Put the recovered garlic and shallots in a new saucepan, along with 2 teaspoon of olive oil. When the oil is hot, add the strawberry grapes and switch to high heat for 5 minutes; then pour the cooking liquid of the octopus and reduce the sauce for another 10 minutes. Now we put it all in a vegetable mill retaining some grapes to finish the dishes and filter it with a perforated strainer. Put the sauce on the stove and let it cook another 5 minutes; Finally, add 5 pink peppercorns crushed with a knife. FINALS - We place a ladle of strawberry grape sauce on the bottom of each dish and decorate with a few drops of olive oil, the remaining whole pink peppercorns and the grapes that we preserved. Then display the potatoes in the shape of a rose and lay some octopus on top. Dress it all with the more sauce and serve immediately.